Observations on film art : Has 3-D already failed? Years ago, James Cameron announced that his upcoming film, Avatar, would only be released to theaters capable of showing it in 3-D. Since then, he has proselytized fervently at trade shows and fan cons, hoping that Avatar would be such a blockbuster that exhibitors would finally decide to make that expensive leap and invest to convert their auditoriums to add 3-D.
Avatar will need about 4,000 screens for a 3-D-only release, estimates Doug Darrow, manager of DLP brand and marketing at Texas Instruments, which makes the chips that power theatrical 3-D projectors. Of course, once the Avatar-inspired infrastructure is in place, other 3-D-only releases will follow. The problems with conversion are manifest. Number one is the expense. 3-D systems are digital, so first the theater owner must convert from 35mm projectors to digital. 3-D is an add-on system that entails additional expenditure. A digital conversion alone costs over $100,000, about five times the cost of a 35mm platter projector. Right now most “D” theaters have 2K projection, but 4K is gradually being introduced for both shooting and showing. (Che and District 9 were shot mostly on 4K.) What theater owner wants to buy an expensive projector that will be obsolete within a few years? And what was supposed to be the breakthrough year for 3-D sees us at what may be the bottom of a huge financial crisis. It has slowed down an already laggardly process. Among commentators, there’s apparently a lot of support for Cameron’s position. This year, coverage of Avatar has been considerable and has mostly echoed his prediction that this is the future of cinema. Geeks who tend to love special-effects-heavy sci fi and fantasy films also tend to long for all of those films to be 3-D. Star Wars and The Lord of the Rings cannot be converted into 3-D fast enough for them. They run websites to express their fervor and to report every new technical innovation and every rumor about a future film perhaps being made in 3-D.
I’ll admit that the signs that 3-D is finally going to become a routine and frequent method for making and exhibiting films are clearer than ever this year. More theater chains are announcing conversion to digital projection after years of resistance. More films in 3-D, and good films, are appearing, like Coraline and Up. And I have to admit that I enjoyed Monsters vs. Aliens more than its tepid reviews had suggested I might. But there are negative signs as well. Perhaps most notably, the major proponents of 3-D, after years of berating the exhibition wing of the industry for its slow adoption of digital and 3-D technology, are still berating it. Jeffrey Katzenberg, who had announced that all Dreamworks Animation features would henceforth be made in 3-D, is one such complainer. Cameron is another. As of now, roughly 320 of the U.K.’s 3600 screen are digital—which doesn’t entail that all have 3-D capacity. In the U.S. it’s 2500 out of 38,000. These days, a major blockbuster may open on 4000 screens or more. Given Avatar’s massive budget, rumored at $237 million (not counting prints and advertising), Twentieth Century Fox couldn’t settle for showing only in 3-D, even if every properly equipped screen in the country showed it. Cameron is a mighty force for change, no doubt. The Abyss and Terminator 2 introduced the sort of morphing technology that made digital effects a reality. But oddly, there aren’t a lot of other directors quite that gung-ho about 3-D. They’re willing to praise it and suggest that they may make films in 3-D, but they don’t go around to trade shows pressuring exhibitors to convert their theaters. Peter Jackson, for example, keeps hinting at such a possibility. Apparently his team is testing the new Red camera’s 3-D model with an eye to using it in the remake of The Dambusters. That’s slated to be produced by Jackson and directed by Christian Rivers. But if Jackson were as enthusiastic about the process as Cameron, wouldn’t The Lovely Bones be in 3-D? Steven Spielberg hasn’t been pushing 3-D, although there are rumors about the Tintin films being 3-D. But rumors and expressed interest don’t influence exhibitors reluctant to invest in upgrading theaters on the basis of the still-limited 3-D product that’s out there so far. Where’s Ridley Scott in this debate? Well, to be fair, he called the Avatar footage “phenomenal,” but I don’t see him making 3-D movies and demanding that they play only in properly equipped theaters. Where’s Tim Burton? Even George Lucas, Mr. Digital Technology, who keeps saying that Star Wars will be converted to 3-D, doesn’t have Cameron’s zeal. Retro-fitting movies is hugely expensive, by the way. One of the few retro-fitted titles, Tim Burton’s The Nightmare before Christmas, has taken to returning annually, as if to remind us of that fact. Even Pixar, which has said it will henceforth make all its films in 3-D, has been strangely low-key about its current project of re-doing the first two Toy Story films in 3-D and re-releasing them as a lead-up to the premiere of the third film, planned in 3D from the start. (This year the first two will be shown at the Venice film festival, which has added a 3-D prize.) Presumably they are content to provide both 3-D and 2-D prints. We’re also not seeing a lot of directors in other countries clamoring for the option of making their movies in 3-D. Hollywood may dominate world cinema in terms of screen time occupied and tickets sold, but there are still thousands of movies made elsewhere each year. Cameron has bowed to the inevitable and is allowing Avatar to play in both 3-D and 2-D theaters. It seems obvious that it will still take years before a film can go out into the world without 2-D 35mm prints being included in its distribution. 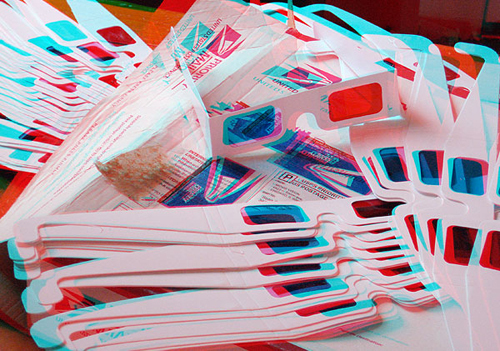 During those years, there’s the potential that 3-D will lose its luster for audiences. One of the main arguments always rolled out in favor of conversion is that theaters can charge more for 3-D screenings. Proportionately, theaters that show a film in 3-D will take in more at the box-office because they charge in the range of $3 more per ticket than do theaters offering the same title in a flat version. Then there’s the fact that the extra $3 is not simply profit. There has to be an employee handing out the glasses, though sometimes the ticketseller does that. And those glasses in themselves cost money. Some will get damaged. When David and I saw Monsters vs. Aliens, there was a woman with a child, perhaps four years old, in front of us in the concession line. She handed both pairs of glasses to the kid while she dealt with paying for the refreshments. He had his fingers all over the lenses, of course. If a theater is using the RealD 3-D system, it’s no big deal if kids with sticky fingers get hold of the glasses. They are so cheap as to be disposable, if the theater doesn’t want to bother collecting and re-using them. Problem is, the theater has to buy or rent a special silver screen to project on. The Dolby 3D system doesn’t require a special screen, but its glasses cost a whopping $50 apiece as of 2007. In Dolby theaters, you’ll find tense ushers waiting outside, making absolutely sure everyone returns theirs for washing and re-use. The Dolby 3D glasses are high-performance, eco-friendly passive glasses that require no batteries or charging and can be reused hundreds of times without sacrificing image quality. The environmentally friendly and reusable glasses can be used repeatedly, significantly reducing the cost down to cents per pair per screening for exhibitors. No doubt 3-D enthusiasts would object that someday the system will be so routine that we’ll all have our own glasses and bring them along. That would cut the expenses to the theater, to be sure. But remember, different 3-D systems require different kinds of glasses. Are audiences willing to collect one of each and keep track of which they need to take along when they head for the theater—especially those $50 ones? (“Check the theaters listings, honey. Is it RealD or Dolby tonight?”) And there are more competitors entering the market, with their own glasses. Is current audience enthusiasm permanent? As usual, the studios take box-office figures to equal enthusiasm on the part of fans. In public, at least, they don’t speculate as to whether 3-D might again be, as it was in the 1950s, a mere fad or a specialized taste. But because spectators are willing to pay extra now because 3-D is still a novelty, does that mean they’ll maintain that attitude once 3-D is common? Maybe not. And maybe even now not all filmgoers care. Some even dislike 3-D. In my review of the 3-D “Journey to the Center of the Earth,” I wrote that I wished I had seen it in 2-D: “Since there’s that part of me with a certain weakness for movies like this, it’s possible I would have liked it more. It would have looked brighter and clearer, and the photography wouldn’t have been cluttered up with all the leaping and gnashing of teeth.” “Journey” will be released on 2-D on DVD, and I am actually planning to watch it that way, to see the movie inside the distracting technique. I expect to feel considerably more affection for it. Ask yourself this question: Have you ever watched a 2-D movie and wished it were in 3-D? Remember that boulder rolling behind Indiana Jones in “Raiders of the Lost Ark?” Better in 3-D? No, it would have been worse. Would have been a tragedy. There is a mistaken belief that 3-D is “realistic.” Not at all. In real life we perceive in three dimensions, yes, but we do not perceive parts of our vision dislodging themselves from the rest and leaping at us. Nor do such things, such as arrows, cannonballs or fists, move so slowly that we can perceive them actually in motion. If a cannonball approached that slowly, it would be rolling on the ground. It’s true that the “coming at you!” effects in 3-D movies are disruptive. I remember the 3-D in Bwana Beowulf, excuse me, Beowulf primarily for those weapons thrusting out of the screen or the gratuitous overhead tracks past beams looking down toward the distant floor. More interesting, though, is that fact that although I saw Coraline and Up in 3-D, I remember them in 2-D. Those films didn’t throw spears at the spectator or otherwise seek to pierce that fourth wall with their props. Of course as I was watching, I noticed that the mise-en-scene had layers of depth and the figures a rounded look, but apparently my life-long movie habits filtered those aspects out as the films entered my memory. I look forward to seeing both films again on DVD, and given the fact that home-theater 3-D is still in its very early stages, I’ll probably see them flat. Fine with me. Yes, Coraline was carefully designed with 3-D effects in mind, playing with skewed perspective to characterize the two worlds the heroine moves between. But as David showed by reproducing a frame here on our merely 2-D blog, the same motifs worked without the glasses. They’re quite similar, in fact, to the forced or distorted perspective used in German films of the 1920s. We saw District 9 this week. No 3-D, and I for one am glad about that. On August 26, TheOneRing.net, the premiere Tolkien site on the internet (for both novels and films), pointed to the current results of its ongoing poll. They asked, “Should the Hobbit films be in 3-D?” Many of the fans who frequent TORN do so because of the films. They have heard rumors over the years, mainly hints dropped by Peter Jackson, that The Hobbit might be made in 3-D. So what is their reaction as reflected by the poll? As of August 26, 55% say no, 13% say emphatically no (“Ugh … 3-D?”), 13% are sitting on the fence, and 13% say yes. Of course, my title, “Has 3-D already failed?” was meant to be provocative. Its answer depends on how one defines success. If you’re Jeffrey Katzenberg and want every theater in the world now showing 35mm films to convert to digital 3-D, then the answer is probably yes. That goal is unlikely to be met within the next few decades, by which time the equipment now being installed will almost certainly have been replaced by something else. Right now, the big proliferation is in tiny personal screens, iPod Touches, cell phones, portable gaming devices. Will teenagers allow themselves to look dorky by sitting with 3-D glasses staring at their phones? 3-D has the effect of making films that won’t play well on the very devices that studio heads would love to see playing their movies. So far, it is a remarkably inadaptable technology to try and force on people whose movie-playing gadgets change every few years. The big break-through, home-video 3-D, is aimed at a machine that people are supposedly abandoning in favor of other screens. 3-D movies on your computer? So much for inviting pals over for a sociable evening of popcorn and a movie in your impressive home theater. Maybe Hollywood will forge ahead, despite all the obstacles I’ve mentioned. But it also seems possible that the powers that be will decide that 3-D has reached a saturation point, or nearly so. 3-D films are now a regular but very minority product in Hollywood. They justify their existence by bringing in more at the box-office than do 2-D versions of the same films. Maybe the films that wouldn’t really benefit from 3-D, like Julie & Julia, will continue to be made in 2-D. 3-D is an add-on to a digital projector, so theaters can remove it to show 2-D films. Or a multiplex might reserve two or three of its theaters for 3-D and use the rest for traditional screenings. This entry was posted on Friday | August 28, 2009 at 12:48 pm	and is filed under 3D, Directors: Jackson, Film comments, Hollywood: The business, Readers' Favorite Entries. Responses are currently closed, but you can trackback from your own site.